Bengaluru: The 126th birth anniversary celebrations of Dr. B.R. 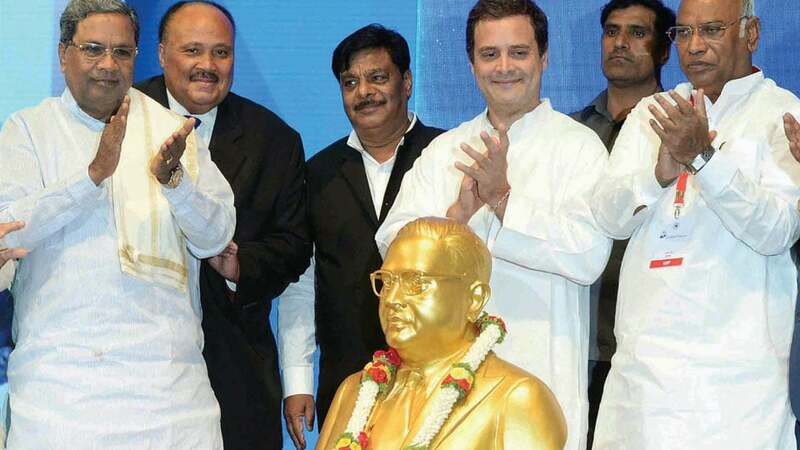 Ambedkar, the architect of the Indian Constitution, organised by the Social Welfare Department, was inaugurated amidst hiccups galore, here yesterday. Congress Vice-President Rahul Gandhi, Chief Minister Siddharamaiah, Leader of the Congress Party Mallikarjun Kharge, American Civil Rights Activist Martin Luther King III (son of Civil Rights Advocate Martin Luther King Jr.), Ministers H. Anjaneya, Dr. H.C. Mahadevappa, Krishna Byre Gowda and other dignitaries were present. The State Government had been preparing for the three-day International Conference with the theme ‘Quest for equity — reclaiming social justice, revisiting Ambedkar,’ held at the GKVK campus, since the last one month. Nearly Rs. 20 crore is being spent and 3,000 invitations had been distributed. However, there was a seating capacity for only 1,000. As more people had turned up, majority could not find a place to sit. Added to this, while the dignitaries were being welcomed and their names called, the bouquets were handed over to some other dignitary. The audience, clapping, had to draw the attention of the compere that it was not that person but someone else. Bollywood actress Nandita Das, who was compering, had to face an embarrassing situation because of this guffaw. She was found defending herself, “I am reading whatever is there in the script. If the organisers have committed a mistake, what can I do?” Even the dignitaries on the dais were embarrassed by this turn of events. There was another blemish while the programme was being inaugurated. When the lamp was being lighted, Minister Anjaneya was found searching for the candle. With so much of bad planning, Minister Krishna Byre Gowda was seen being upset with the organisers. Roars of laughter: American Civil Rights Activist Martin Luther King III, with his heavily accented American English, sent the audience into peals of laughter, when he tried pronouncing Indian names. King’s address: In his inaugural address, Martin Luther King III said that because of the society’s ugly structure, his father (Martin Luther King Jr.) had to lose his life. Even today, he could not forget that experience. To have an egalitarian society is very important. However, the caste system is still deep rooted. Ambedkar tried to remove the caste system. In all countries, the caste system still exists and India is not unique to this practice. “India is the world’s largest democracy and the population has also gone up. More than 60 percent of the people live below poverty line,” he said and added, “I oppose caste system. The practice of untouchability is still alive. As long as it exists, the development of society is impossible. Dr. Ambedkar, like my father, fought for the education of the underprivileged,” he said. “I have visited India several times. My first visit was in 2008. But, this is my first visit to Bengaluru. It is a fast-growing city in IT,” he said. According to King, the Blacks’ position has not changed in the US. There is racial divide there and all Blacks still suffer untouchability. “But we are proud to call ourselves as untouchables. In the society, women should be given equal rights. In America, women have been given complete independence. Everyone should have access to social justice. Education is the only course to set right the society,” he said. Blasts Modi: King went hammer and tongs against the policies and stand of Prime Minister Narendra Modi’s Government. “In Modi’s Bharat, divisive politics has increased. The Hindu fundamentalism is growing in this country. There are atrocities against the Minorities. The cow vigilantes are increasing their attacks on Muslims and Dalits,” he said expressing, his sadness.